Sugar Mountain® Blue was specially selected in the Czech Republic for its extra-large fruits. Once you taste these berries, you won’t be able to get enough, and planting a pollinator variety with Sugar Mountain® Blue will provide the most abundant fruit set – look for Sugar Mountain® Balalaika™, Eisbär™, or Kalinka™. Sweetberry honeysuckles can be eaten fresh right from the bush, cooked into jam, pressed for juice, or made into sauce or pie filling. 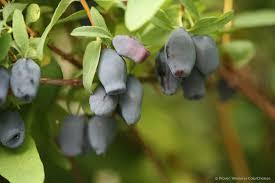 The fruits can also be dried or frozen to enjoy a taste of summer on a cold winter’s night.